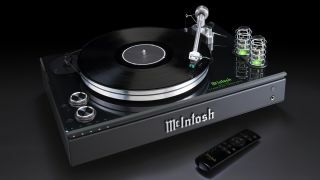 McIntosh MTI100 is an all-in-one turntable with Bluetooth | What Hi-Fi? The new McIntosh MTI100 (£7500/$6500) is as committed to bridging the gap between analogue and digital than any other turntable we’ve seen. As it has accompanies vinyl-spinning duties with built-in amplification and speaker outputs, a pair of speakers can just be plugged straight into it - much like the budget Pro-Ject Juke Box E we gave a 2018 Award to. There’s Bluetooth connectivity, as well as several analogue (3.5mm) and digital (coaxial, optical) inputs for plugging in any various sources. And in addition to stereo speaker sockets are both subwoofer and headphone outputs, the latter powered by McIntosh’s High Drive headphone amp. A vacuum valve preamplifier (driven by two 12AX7 vacuum tubes) is separated from a shielded phono preamplifier and paired with a Class D power amplifier that delivers 80 watts per channel (into 4 Ohms) or 50 watts per channel (into 8 Ohms). As we expect from a McIntosh product, the MTI100 appears well built. The 3.18kg machined-aluminium belt-drive platter and matching machined-aluminium tonearm (with anti-skate) sit atop a 9.5mm-thick piece and a 6.35mm-thick metal plate for added stability - their combined heft working to absorb noise caused by vibrations. The MTI100 comes supplied with a Sumiko Olympia moving magnet cartridge, which benefits from an upgraded stylus and cantilever assembly. Power, volume and input selection can be controlled by either the included remote or via two knobs on the unit. The MTI100 can be ordered now, with shipping expected to begin in January (US) and March 2019 (UK).